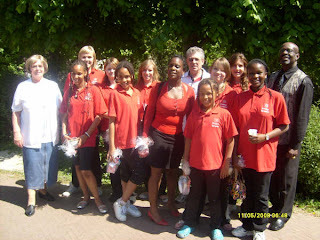 Our dear youth gospel choir was in the Life Word Christian centre in Utrecht recently to minister. It went well, but not without hiccups. They say, sometimes, it just doesn’t rain, it pours. 3 – 4 tones higher, and songs were unsingable (is that a word ?) 2 different keyboards later, our Pianist Ilvio could play. Half of the group in a bus did a bit of drive around and arrived half an hour later than arranged ! How much can a man take, but we went on and sang and the people were blessed but with much less sound check as I will. Thank God for his grace. It is sufficient for us. God never promised a life without any issues but the strength to deal with them with HIM on our side. We’ve got the victory.